A facelift, also known as rhytidectomy, is a surgical procedure that improves the appearance of the aging face by re-supporting underlying facial tissues and removing excess skin to achieve a more youthful, smoother facial appearance. It can improve a sagging jaw line, blunted neck line and overall appearance and youthfulness of the face. Dr. Bublik believes that facelift surgery is not about simply applying the same technique to every patient. In older style facelift surgeries, the skin was pulled tightly back leading to an artificial, windswept or "done" appearance. Our priority is to create harmony and beauty through judicious tightening and volume restoration to yield more natural and rejuvenated outcomes for our Los Angeles patients. In time, gravity, sun exposure, and the stresses of daily life take their toll on our faces and necks. Deep creases appear beside the mouth, the jaw line slackens and becomes jowly, and the neck develops loose folds and fat deposits. A facelift counteracts these signs of aging and restores a youthful appearance by tightening muscle, removing fat, and trimming excess skin, giving your face a fresher, youthful and natural appearing look. After surgery, some patients look 10-15 years younger and look more well rested. Facelift incision are hidden and are camouflaged ensuring that nobody will look at you and say that you had a facelift. 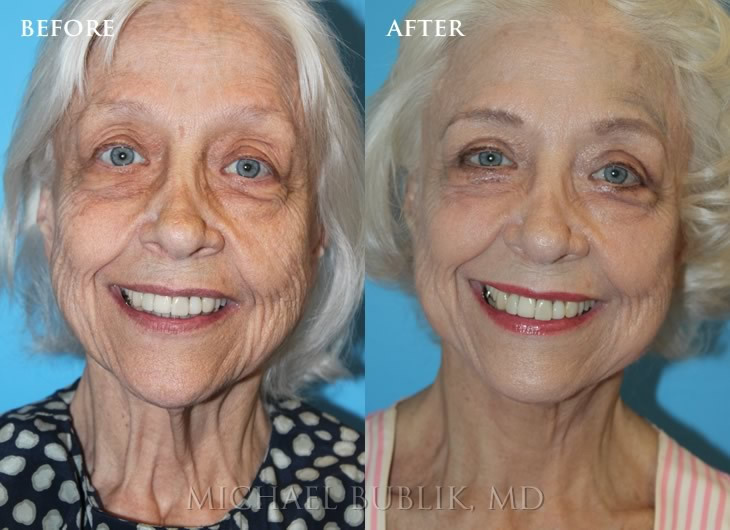 Dr. Bublik has extensive experience with advanced facelift techniques. During the consultation, Dr. Bublik will evaluate your unique facial structure, aging pattern and specific desires in order to select which treatment is most appropriate.